Compressed gas cylinder storage offers compliant chemical storage solutions for flammable, corrosive and combustible substances. Compressed gas cylinders are used in wide variety of applications including university laboratories, marine terminals, construction operations, oxy-fuel welding, medical procedures and oil and lubricant manufacturing. Gas cylinders can cause hazardous work environments if inventory is not properly stored and maintained. Below is a list of compressed gas cylinder storage guidelines to ensure a safe storage atmosphere. Segregate incompatible substances from compressed gas cylinders. Ensure mechanical ventilation when storing hazardous compressed gases. Gas pressure regulators should be inspected once every 5 years. Safely classify compressed gas cylinders away from oxidizing gases. Segregate oxygen and fuel gas cylinders with solid partition walls or store in separate gas cylinder storage buildings. According to OSHA, under the General Industry standard 29 CFR 1910.101, store compressed cylinders at temperatures below 125°F. Store compressed gas cylinders in an upright position with gas cylinder storage racks. Keep compressed gas cylinder storage away from flammable substances. Keep inventory away from moisture, and extreme temperatures with climate controlled storage buildings. Rusting or corrosion can damage gas cylinders, creating a dangerous storage environment. Routine inventory inspections can prevent these hazardous situations. Do not store gas cylinders near exits or entryways. Utilize gas detection systems to ensure gas cylinders are not leaking. Store corrosive substances in a separate gas cylinder storage building. Properly label inventory into separate groups: “full” or “empty”. US Chemical Storage is dedicated to keeping personnel, facilities and the environment safe. With a wide variety of customizable chemical storage units, US Chemical Storage is the leading provider in safety and compliance. 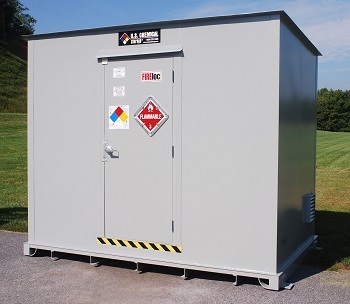 Gas cylinder storage buildings by US Chemical Storage are designed to compliantly store your hazardous materials, while keeping your personnel and facilities safe.